Burnatonce is a nice, trial version Windows program, that belongs to the category Software utilities with subcategory CD & DVD (more specifically Burning). About the download, Burnatonce is a software that takes up less storage than the average program in the section Software utilities. 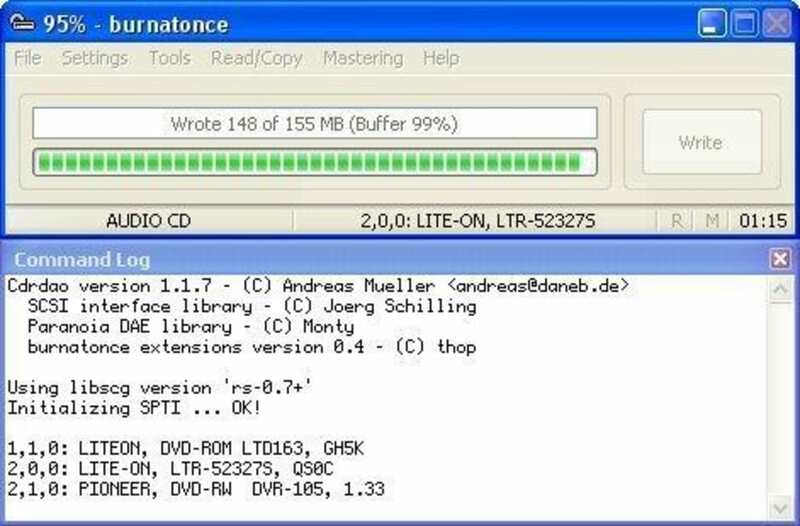 It's very heavily used in countries such as China and Brazil.Since we added this software to our catalog in 2005, it has achieved 15,593 downloads, and last week it achieved 10 downloads.Burnatonce is available for users with the operating system Windows 95 and prior versions, and it is available in English, Spanish, and German. The software version is 0.995 and its last update was on 4/24/2003. Burnatonce can master both data and audio discs, read/write image files and also is able to copy on the fly. Its drag and drop interface has multi-language support and is fully compatible with XP themes. Multisession and bootable disc mastering is supported as well as long filename support using Joliet, Long Joliet and Rockridge. Extra long filename support is provided with the ISO9660:1999 and UDF filesystems. Audio discs can be compiled from wav, mp3, mp2, ogg and flac files as standard while support for other audio formats can be added optionally. CD-Text can be written from the built in editor, imported from freedb, read from media tags or extracted from filenames. Pauses between tracks can also be set as silence, pregap or postgap of varying lengths. What do you think about Burnatonce? Do you recommend it? Why?